By the time most patients are transferred to NYC Health & Hospitals/Carter, they've been in an intensive-care unit and on a ventilator for more than three weeks. Carter, a long-term-care facility owned by the nation's largest public health system, is focused on getting those patients healthy enough to return home. A big part of that is weaning them off the ventilator. The quality of life and health of a patient dramatically improves when they no longer have to rely on a ventilator to breathe, said Dr. Vasudeva Raju, Carter's chief medical officer. Implement a 24/7 care team focused exclusively on ventilation weaning. Encourage patients to increase their physical activity, helping them to get off the ventilator sooner. Make psychologists available to help patients and their families get through emotional struggles during the ventilator-weaning process. Patients can get out of their beds, communicate better with their family and care team and—most importantly—leave the hospital sooner when they can breathe on their own. “They are able to go home-that's probably the single biggest reason why its important to take patients off ventilators,” Raju said. 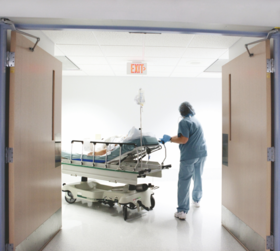 Keeping patients hooked up to ventilators is also expensive and can be dangerous. 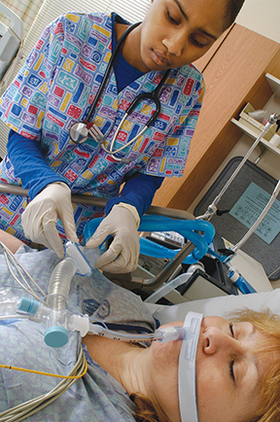 Roughly 10% of ICU patients placed on a ventilator develop ventilator-associated pneumonia, according to a November 2016 JAMA study. The ventilator-associated pneumonia mortality rate is nearly 50%, according to the Institute for Healthcare Improvement. To help patients breathe on their own, NYC Health & Hospitals established a unit at Carter in 2013 dedicated solely to gradually moving patients off of a ventilator to allow their lungs to get back to full strength. The 14-bed unit is staffed 24/7 with a respiratory therapist, pulmonologist, internist, four nurses and two nurse aides. The around-the-clock staffing is particularly important given that these patients are often medically complex with multiple chronic conditions that need to be closely monitored, Raju said. Patients are transferred to the unit once their physician determines they are stable and ready to try to breathe on their own. The ventilation care team visits patients each morning during rounds to see how they are progressing. The clinical staff are constantly monitoring the patients' co-morbidities to ensure they remain healthy enough to continue the ventilator-weaning process. The nursing staff helps patients improve their physical activity to strengthen their lung muscles and also suctions their lungs to break down any buildup of fluids that might make it more difficult for them to breathe. “There is an effort made in a step-by-step fashion to reduce the dependence of the patient on a ventilator,” Raju said. A member of the psychology staff is also made available for patients and their families who are emotionally distressed during the ventilation-weaning process. It can be a nerve-wracking and scary experience for patients to be weaned off a machine they have become dependent on for a substantial period. In fact, a 2010 study found that of 478 patients who were being weaned from prolonged ventilation, 42% of patients were depressed. The concentrated effort by the Carter team has paid off. Since the ventilation-weaning unit was established in 2013, the facility has successfully weaned 345 of 539 patients admitted to the unit, representing a 64% success rate; that's much higher than the national average of 50%.